Freddy Freeman and Shazam getting into mischief. 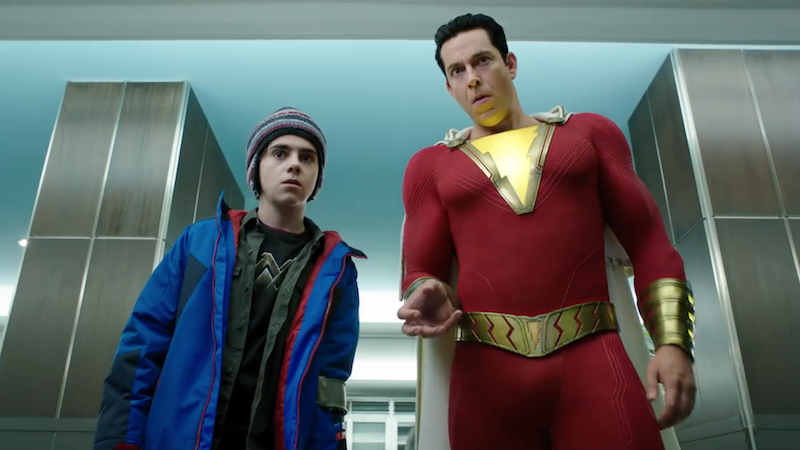 Interestingly, both of the Shazam scenes that play after the proper film is done focus on things you actually see for the first time over the course of Billy Batson becoming a superhero. The more cryptic of the two stingers establishes an important part of Shazam’s mythos from DC Comics suggesting that when next we see him, it’s not just Black Adam that he’s going to have to worry about. Early on into Shazam there’s a scene in which a young Thaddeus Sivana meets the ancient wizard Shazam, who’s summoned him to the Rock of Eternity believing that the young boy might make a suitable new champion worthy of wielding his vast magical power. As Sivana makes his way into Shazam’s lair, there’s a brief shot showing off some of the many artifacts the wizard’s collected over the years, like a perpetually-burning string instrument, the demon-harnessing orb that eventually grants Sivana his Shazam-like powers, and a tank containing a large caterpillar. When Billy Batson eventually makes his way to the Rock to become Shazam, the burning instrument is still there, Savanna’s long since stolen the orb, and the caterpillar’s seemingly escaped from its now-broken enclosure. DC’s Mister Mind is indeed an insect-like creature and one of Shazam’s odder villains from his Golden Age days as Captain Marvel in Fawcett Comics’ books. He was first introduced in Adventures of Captain Marvel #22 as the mastermind behind a coordinated attack on Shazam’s life that he directs over the radio. Though the villain initially lives in a dreadful castle on the surface of Venus, he develops a hatred for Shazam (and by extension Billy Batson) after he inadvertently intercepts Billy’s news broadcasts from Earth where he works as a radio reporter. At first, Mister Mind calls upon Captain Nazi and orders him to try and beat Shazam on his own, but when that initial plan fails, the insectoid reveals that his actual scheme to defeat the hero involves bringing together the whole of his rogues gallery to form the Monster Society of Evil. An opening page of the “Monster Society” arc in Captain Marvel Adventures #22. After making his debut and subsequently dying during that first “Monster Society” arc, Mister Mind would disappear from the comics world for decades following Fawcett Comics’ shuttering and the Captain Marvel comics rights moving over to DC Comics. In the early ‘70s, Mister Mind remerged and became one of Shazam’s most regular foes; as time has gone on, the specific nature of the villain’s powers and his reasons for being evil have shifted as different writers have incorporated them into their stories. Mister Mind in his hyperfly form.